This is a lovely warm, nutritious dish - just the thing on cold winter days! 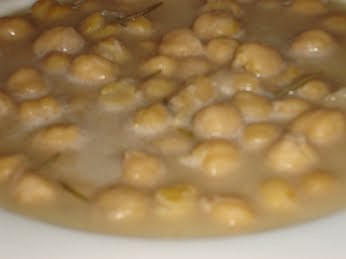 Although it's not a 'last-minute' dish - you have to soak the chickpeas overnight - it's a very simple and cheap recipe. Very popular, especially in the villages. Drain them the following morning, add the baking soda and leave for 1 hour. Put your hands in the bowl of chickpeas and rub them well. Rinse the chickpeas very well 4 or 5 times. Put them in a pan and add enough water to cover them. Bring to the boil, removing the froth at the top with a wooden spoon just before they come to the boil. 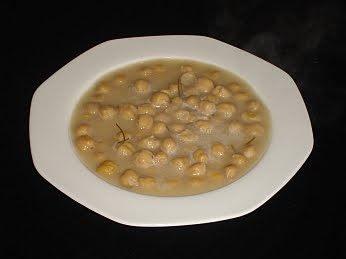 Drain the chickpeas and then put them back in the pan and add enough warm water to cover them again. Bring to the boil, add the onion and rosemary and simmer for about 1½ hours or until they are really tender – don’t let them get dry and add water if necessary. Whisk the olive oil with the lemon juice and add to the chickpeas. Simmer for about another 5 minutes and then serve. Wonderful soup I love it. Thank you for the recipe.